The Original Perfect Pushup, developed by Alden Mills, is based on his U.S. Navy SEAL workouts. The Perfect Push Up Bars build arm strength, build chest muscle, and increase upper body strength. The Perfect Push Up - Original started out as a "As Seen on TV" product... and exploded into a legitimate strength-building compliment to work in the weight room. While serving as platoon commander, Alden Mills, a 7-year United States Navy SEAL, participated in a study to determine why so many SEALs suffered training injuries. Once it was found that the aggravating injuries were due to antiquated training methods, the wheels began to turn in Alden Mills' head. 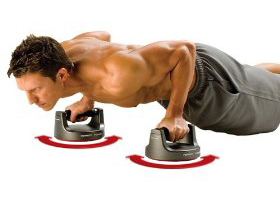 He developed the Perfect Push Up based on his knowledge of the switch to Functional Training for the demanding SEAL exercise routines used to increase upper body strength. What sets The Perfect Push Up apart from other pushup bars? The Perfect Push Up - Original is a biomechanical engineering masterpiece. It is an exceptional addition to your home workout equipment. It's light, sturdy, and durable. * One note...using The Perfect Push Up will NOT turn you into a a 300 lb bench press club member. However, that's not the goal of these bars. They are designed to increase your functional strength by recruiting more upper body muscle.